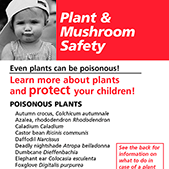 Help us promote poison safety. All materials are FREE! 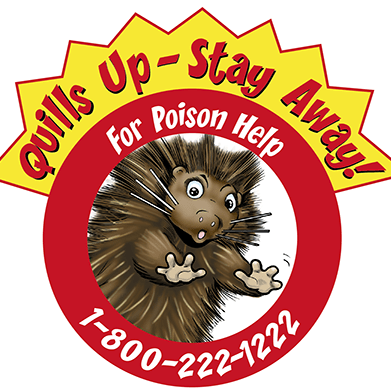 Download poison prevention videos and materials. Order printed materials. 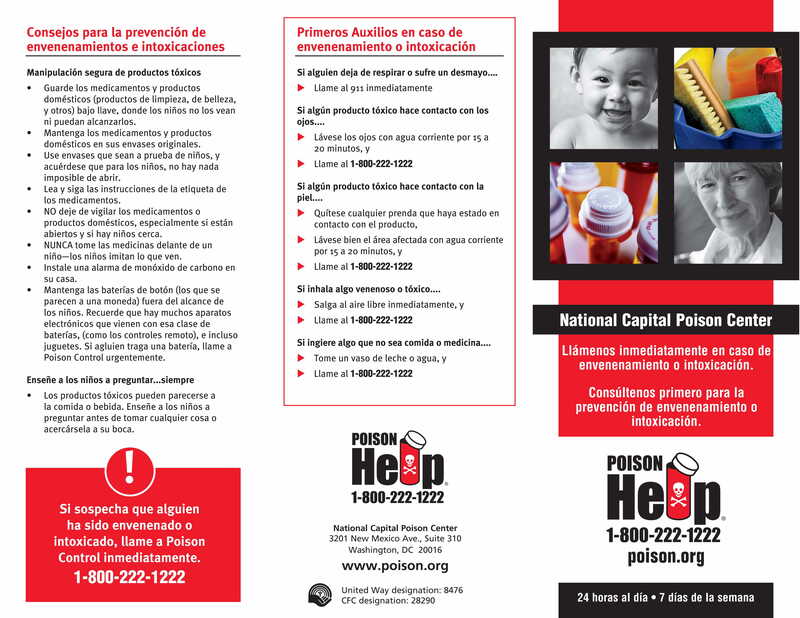 The National Capital Poison Center mails prevention materials to metro DC only. If you are outside this area, please call your poison center at 1-800-222-1222 to order. If you are in the Washington, DC metro area and would like to request printed materials, enter your zip and complete the form below. Enter your 5-digit zip code to start your order. Thank you for your interest in poison prevention. 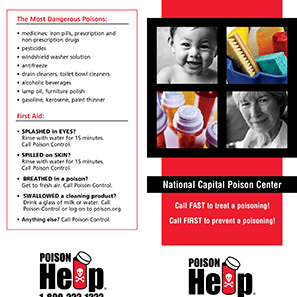 The National Capital Poison Center only serves the Washington, DC metro area. The zip code you provided is outside our region. Please contact your poison center for prevention materials. 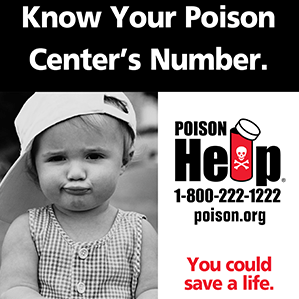 Call 1-800-222-1222 to reach your Poison Center (US only). Please add at least one item to your order. 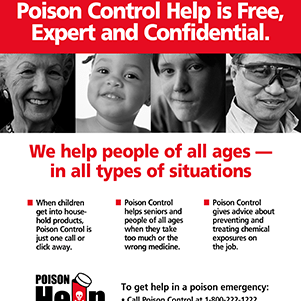 Please note the default package includes a poison help magnet, a poison help sticker sheet (2 stickers) and a brochure. If you want additional materials, specify the quantity for each. Allow 2-3 weeks for delivery. We recommend these 3 items if ordering for home use. Poison Help magnet. 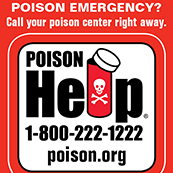 Place on your refrigerator so Poison Control's number is always handy. Stickers. Two stickers on a sheet. Place these on or near your telephones. Count each sheet as one item. Brochure. 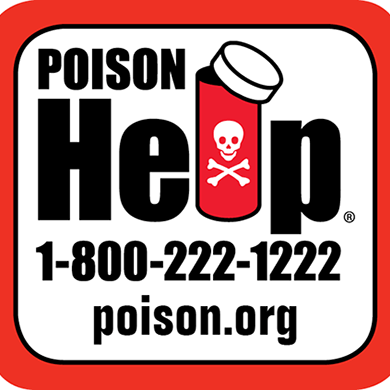 Poison prevention information and guidance for poison emergencies. Two Ways To Get Help. Two sided card. 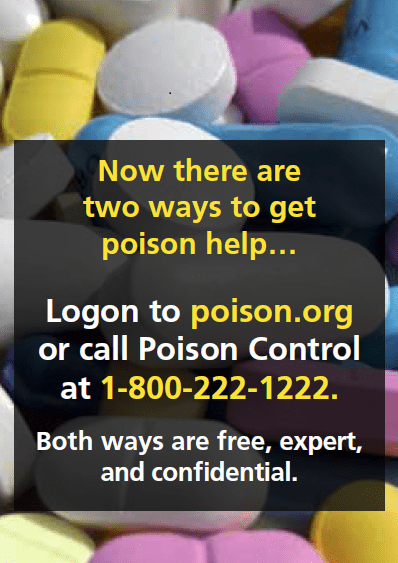 Two ways to access poison control help plus poison prevention tips. 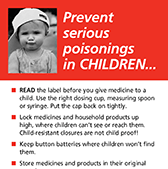 Tip card: Prevent poisonings in children. List of tips and 2 adhesive stickers with Poison Control's telephone number. 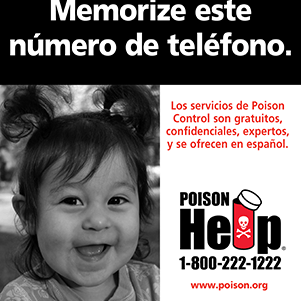 Tip card: Prevent poisonings in children (in Spanish). Prevenir los envenenamientos e intoxicaiones con 2 pegatinas del teléfono de Poison Control. Plant card. Handy reference list of toxic and nontoxic plants. Inhalant brochure. 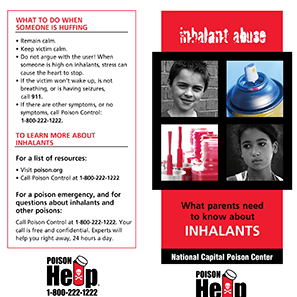 Protect your children from inhalant abuse. A brochure about the who, what, when, where, and why of this teenage substance abuse danger. Tríptico en español. Primeros auxilios y consejos en caso de intoxicación o envenenamiento. Posters are for hanging in offices or on school or community bulletin boards and are not intended for mass distribution. All posters 8.5" x 11" unless otherwise noted. The complete Spike program, including the delightful puppet show and teachers guide, is available online. It's faster and easier than ordering! 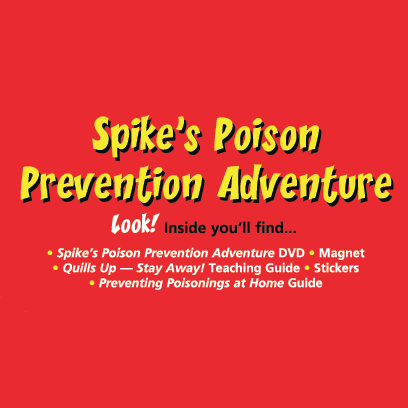 Spike DVD: Quills Up Stay Away! puppet show on DVD. Want the video online, now? Use the link above. Nontoxic temporary tattoo of Spike. Use these with DVD.